I also expected much more from many of the cast members which includes; Ralph Fiennes, F. Murray Abraham, Adrien Brody, Willem Dafoe, Jeff Goldblum, Harvey Keitel, Jude Law, Bill Murray, Edward Norton, Tilda Swinton, Tom Wilkinson, Owen Wilson and Tony Revolori. In particular I'll go and see a film on the strength of Bill Murray being in it. Sadly he barely says much at all here and doesn't get much screen time to do anything other than fill a role that could have gone to anyone. Edward Norton is usually someone to watch too. Whilst he is used well here, and he gets a lot to do, his part could have gone to anyone with the right look. Fortunately the film is carried well by the main players, Ralph Fiennes as Gustave H and Tony Revolori as his long suffering but trusted co-collaborating lobby boy, Zero. Two characters that you really do latch on to and hope it all works out. Willem Dafoe also puts in a very memorably scary performance as Jopling - I'd go so far as to say Willem was born to play the role - which doesn't have a lot of dialogue but his character certainly has a presence that is very much enhanced by his performance. 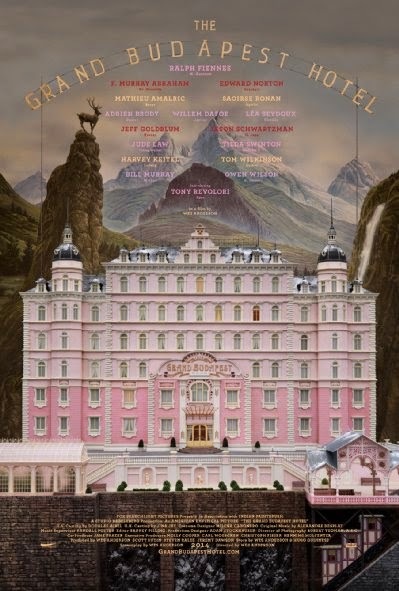 Overall, The Grand Budapest Hotel tells such a charming and intriguing story in such a way that you'll likely forgive any short comings like the actor you went to see it for having very little screen time. It's a little edgy and dark but not so dark you'll be offended or put off. It has an interesting style that seems to hark back to movie making of a by gone era but still seems very contemporary. Most of all, you'll have a good time watching the misadventures of the legendary concierge, Gustave H and his lobby boy, Zero. The only names I'm familiar with are Bill Murray and Jude Law, but I haven't watched him in much. Edward Norton sounds a bit familiar. I might know some faces. With the title I thought they were trying to cash in on The Marigold Hotel. I thought it would probably share some similarities with The Marigold Hotel too but the two films couldn't be more different.